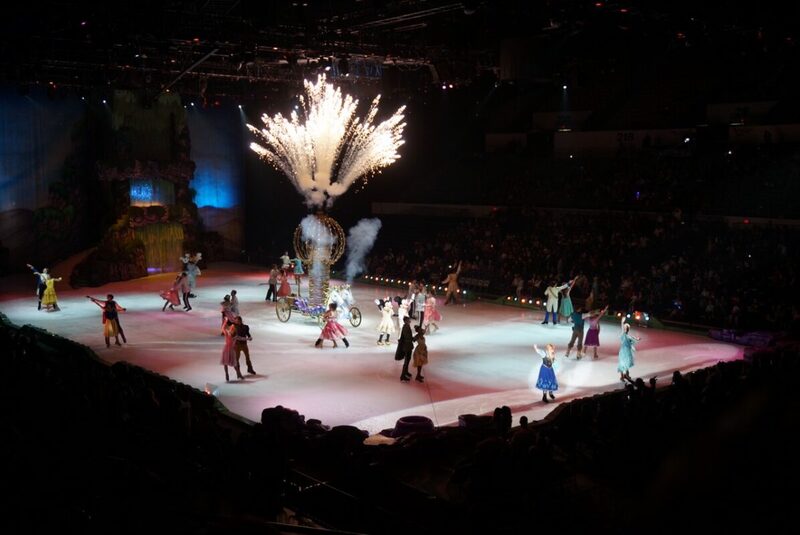 Last night, we were able to attend the opening night performance of Disney on Ice: Dream Big at the Long Beach Arena. 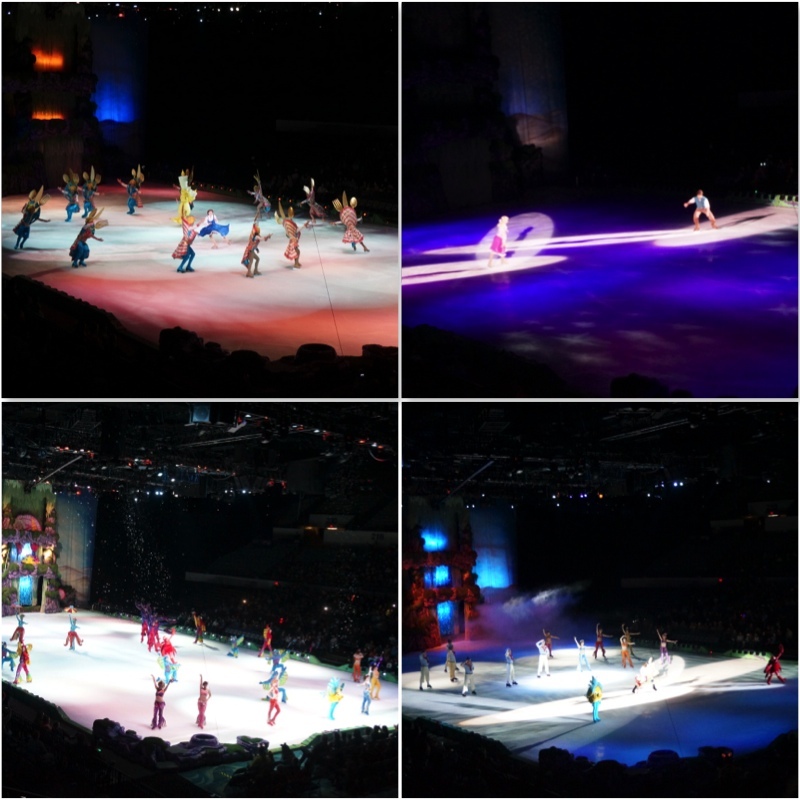 This was our second time attending a Disney on Ice show and it was as amazing as the last one. We had an incredible time watching the amazing acrobatics and phenomenal skating. Plus, who doesn’t love Disney Princesses? The performance is divided into two parts with a short 15 minute intermission. Disney on Ice: Dream Big tells the stories of some our most beloved Disney princesses and how their dreams came true. 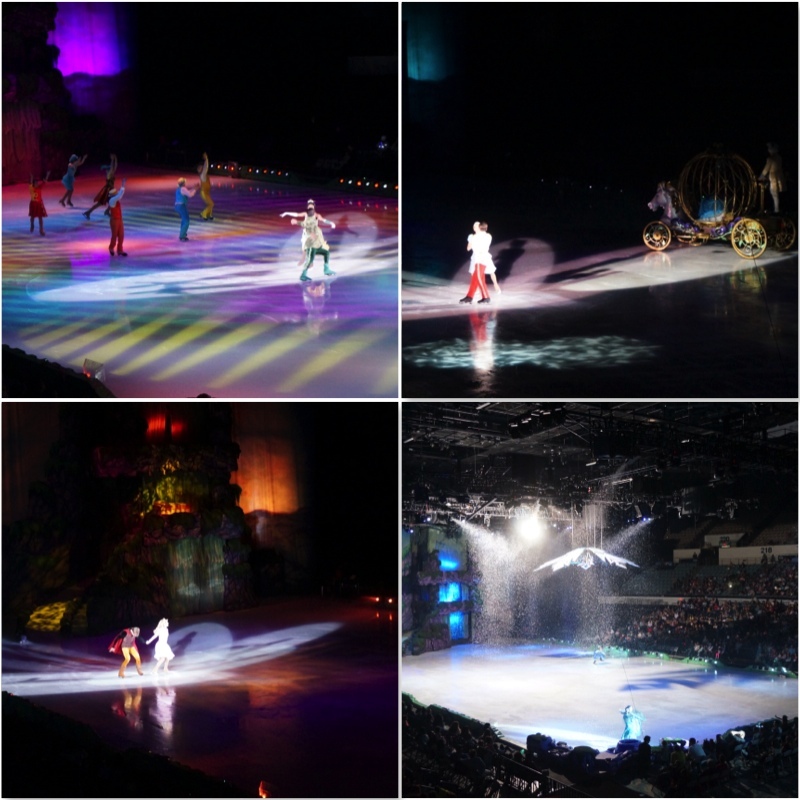 The show is filled with special effects, amazing skating and acrobatics on skates! Tinker Bell, Mickey, Minnie and even Goofy all make an appearance! 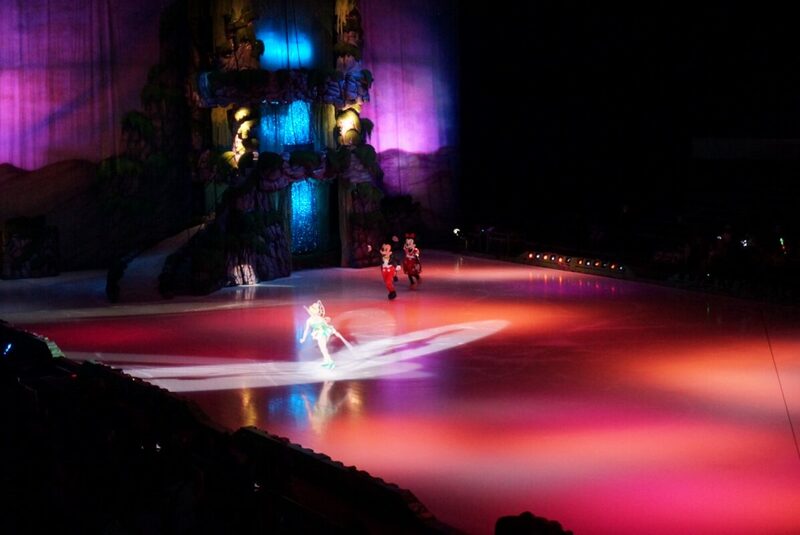 The show begins with Tinker Bell skating along the ice as she leaves behind a trail of sparkles to welcome the audience. Our hosts, Mickey and Minnie enter to introduce each story and princess. First we are transported to the streets of Agrabah where the riffraff Aladdin and Princess Jasmine first meet. We loved the part when the Genie came out of his lamp! Other performances from this segment include Snow White, Belle, Rapunzel and the Little Mermaid. 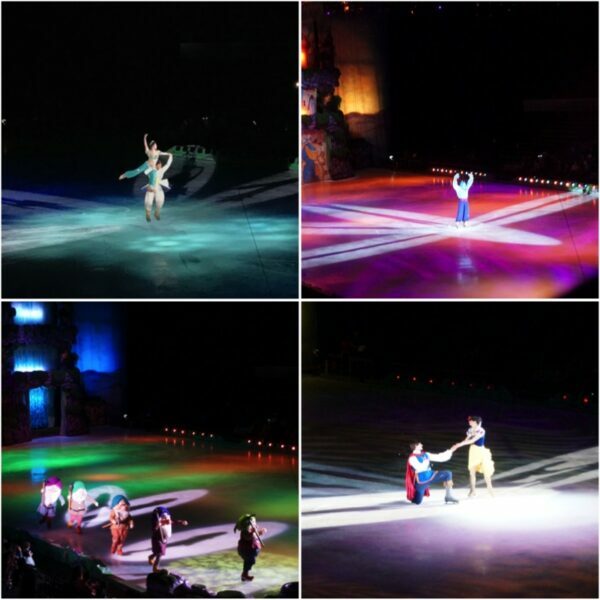 Our favorite part of this segment of Disney on Ice was Beauty and the Beast and The Little Mermaid. The acrobatic sailors in the Little Mermaid were phenomenal as they jumped and flipped on skates! These two parts were a little longer than the other stories in the first half of the performance. After the intermission, Tinker Bell, Mickey and Minnie, introduce the next stories. In this segment we get to see Princess Tiana, Cinderella, Sleeping Beauty and Frozen. There were a lot of pyrotechnics with a fire breathing dragon and other special effects! The show ends with Frozen which is the longest out of all the segments. At the very end, all the princesses, princes, and heroes come dressed in their best for a finale. The show was magical and empowering for all who love Disney princesses! Even though we saw Worlds of Enchantment, this was still worth seeing because it’s a completely different show. Some of the performances were only one or two songs while some of the audience favorites incorporated part of the story along with the singing and skating. 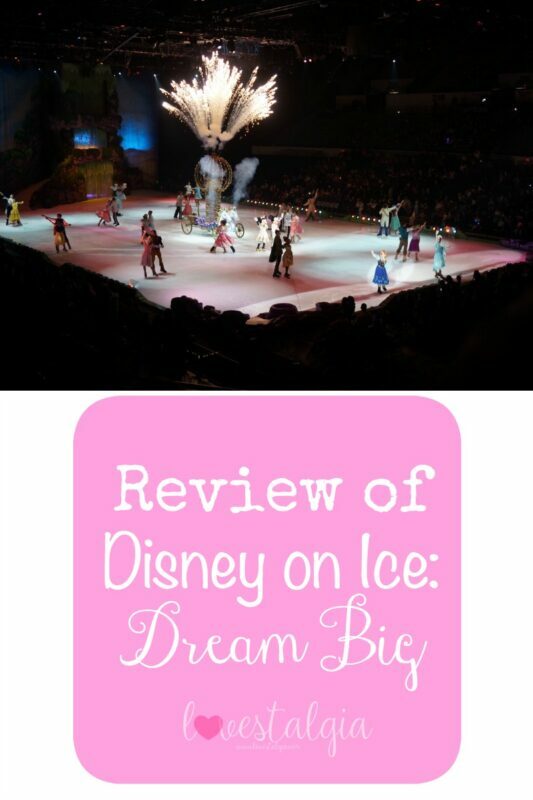 This might actually be our favorite Disney on Ice show because we love Disney princesses. Bring a light jacket. It wasn’t that cold inside the arena but once you stepped outside, it got chilly. Dress in costume! We dressed A up in one of her princess costumes with a tiara and everything. We saw quite a few little princesses running around. Bathrooms have long lines. As to be expected, the bathrooms had huge lines so we went before the performance and afterwards. If you go as a family with your husband or significant other, have them take your child to the bathroom at intermission. Typically the men’s restroom bathroom lines are shorter. Bring cash. There are vendors who walk around and sell cotton candy, lemonade, popcorn, and light up toys. It’s easier to pay cash for them. If you don’t want to buy any of the toys or snacks, bring your own. I did bring my own little light up wand for A but we went with her grandma who ended up buying her TWO light up toys! Tickets are still available for both venues. Be sure to get your tickets! You can check my previous post for a discount on select shows! Don’t miss out!